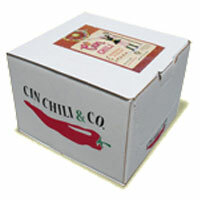 Home > Manufacturers > Cin Chili & Co.
Cin Chili is a family owned business started by Cindy Reed Wilkins. Cindy has two first place trophies from the Terlingua International Chili Championship. She is the only person who has won it twice; and she won it, back to back, in 1992 and then again in 1993. The Terlingua International Chili Championship Cook-off is held each November in the middle of the desert, just south of Terlingua, Texas. After years of perfecting "the recipe," she decided to let the chili lovers enjoy and savor her chili without attending a sanctioned cook-off. Cin Chili & Company is a newly formed, family owned company, that's hoping you'll become part of our family too. Cin Chili won the First Place 2006 Scovie Award for Chili Con Carne.